Paint Odor Valved Respirator is used for nuisance level latex paint, stain and solvent odors. It is NIOSH approved and provides at least 95 percent filter efficiency against solid and liquid particles that do not contain oil. The patented Cool Flow valve allows easy exhalation and heat reduction for cool, dry comfort. The m nose clip feature allows fewer pressure points on the face and greater comfort. 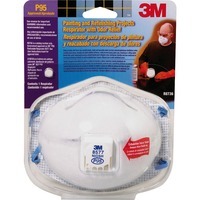 Easy to use and comfortable, this respirator is a great choice in respiratory protection for both the pro and do it yourselfer when working on projects that include odors from latex paints, stains and solvents.